While it is a small book and this is a medium sized verse, the impact it can make on each of our lives is INCREDIBLE, but we have to want it - the impact... That impact, stemming from this verse, is an example of how the Word of God has instruction that is backed up from within the covers of the Old Sacred Book. The title of "Old Sacred Book" is not used in this day and age, as it was centuries ago when they were less plenteous. "How do you know if you are good enough or have been good enough to go to Heaven?" We don't "do" good things in order to merit Heaven, we have to place our trust and faith in the Good Shepherd, the Son of God, the Lord of Lords - Jesus Christ, accept His FREE gift of Salvation - which only He could pay for. Then our lives need to show the transforming of our minds daily by reading His Instruction Book for Christians, the Bible. In that manner, He is showing us what it is to be good and the steps about how to accomplish that desire, as we seek to please Him in our lives. The "secret" which is unlocked by reading God's Word is that He has already shown others throughout the ages exactly how to do what is good, right and acceptable in HIS Sight, not man's sight. There are thirty (30) passages of Scripture used in this Series that will show all of us some of those things from His Own Word that we can do to not model ourselves after Him, but to actually please Him in each and every one of our actions. 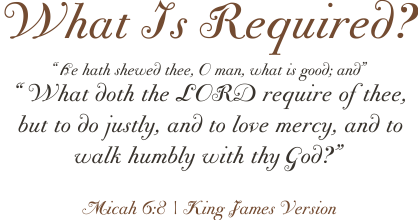 There are three areas of Requirements presented in this Series, including: Do Justly, Love Mercy and Walk Humbly. 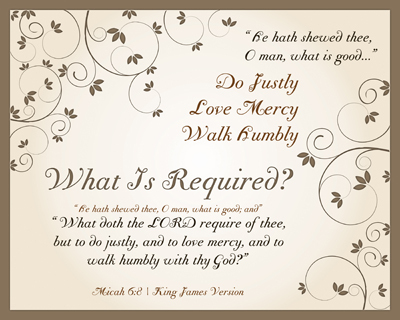 An amazing collection of Scriptures were found to help you and I both understand more clearly what it means that we've been "shown" in each of them "what is good" and how it related to REAL people. We have a completed text which has an ever ability to help us understand what our Creator God wants us to know as we live each of our lives, day in and day out for Him.